Full disclosure, I have been a long time fan of Batman. He has been one of my favorite characters since the first Tim Burton Batman movie was released in 1989. I enjoy everything from the campy 1960’s television show to the most recent Christopher Nolan trilogy. I have at least one long box full of nothing but Batman comic books. For me he is such a compelling character for multiple reasons that I will not list here. I am fully aware of the various storylines that have went on in the past 10 years involving Batman and I have only read single issues sporadically. There have been some good stories told recently, but sometimes the sheer doom and gloom that many people feel Batman needs to be in the modern era, based on Frank Miller’s classic The Dark Knight Returns, weighs the character down and makes him less interesting in some regards. It is nice to occasionally have a break from the darkness. That is where Batman, Incorporated comes in. Grant Morrison is one of my favorite comic book writers and personalities in the industry. He is intelligent, witty, and very unique in his thought processes. His book Supergods is a must read to get his insightful take on the mythology of our favorite comic book characters and a little more knowledge of Morrison himself. When I saw this collected edition of issues 1-8 and the one shot Leviathan Strikes! I knew I had to give it a shot since the combination of a great writer with a legendary character had to be worth the read. Thankfully, I was right. 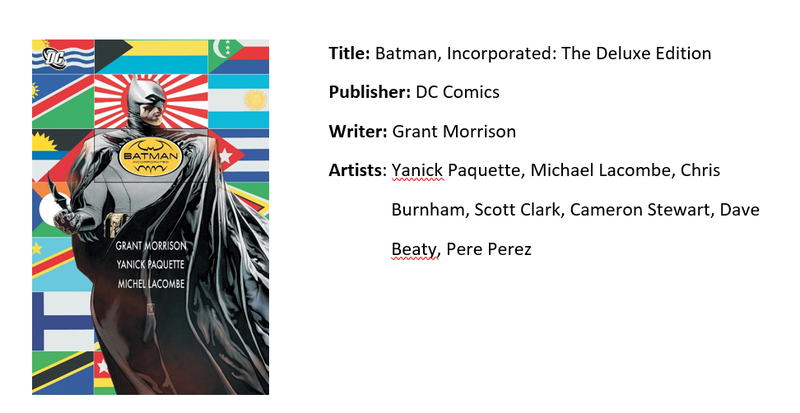 The whole concept of Batman, Incorporated is that Batman/Bruce Wayne is traveling around the world recruiting international heroes to join his group and become Batmen to assist him in his fight against a new terrorist group called Leviathan. There is a true ‘fun-ness’ to this book that made it hard to put down. Don’t get me wrong, there is nothing silly about this tale, especially some of the imagery we see through the miniseries and especially towards the end of this collected edition, but the overall tone is much more enjoyable and not as dark as some of Batman’s well known storylines. The different variations on Batman are inventive and great to see. I especially enjoyed the Native American version Man-of-Bats. His focus was helping his own people by any means necessary and his nobility was admirable even though we saw some flaws in his approach. He is a very human hero that anyone could become, whether or not they had the finances to do so. Grant Morrison really seemed to enjoy writing this tale which results in the reader experiencing the same emotions throughout the series. The team of artists on this series all had their own styles well represented, yet still made every issue seem artistically cohesive. The art popped off the page and really grabbed your attention and made this series very engaging. The only thing that was a slight disappointment is that I saw the twist ending coming from a mile away. I did not know the outcome of this series so I went in fresh and I was still able to figure out who the mystery person behind Leviathan was going to be. I will not spoil anything, but many long time readers probably did the same. Despite this fact, the ending was still good and did not detract from anything. This deluxe edition is a great collection of an amazing miniseries and will look great on your bookshelf. If you are a fan of Grant Morrison, Batman, or just good storytelling, then this is a must read for you.